The Wallabies are back in this game. Matt Toomua is the man to touch down, but it was a Kuridrani intercept from a Savea pass that did the damage. The timing of Savea's pass was just out and the All Blacks have been punished. If Savea got the pass away a split second sooner the All Blacks would have scored as they had a big overload out left. But he didn't and they didn't. Instead Cooper knocks over another conversion and the All Blacks now lead 33-26. All Blacks lineout now 5m out from the line. More pressure on the Wallabies. They have to stop leaking points if they want a real chance at getting back into this. Penalty against Ben Robinson. Cruden should convert an easy three. They obviously didn't listen to me about leaking points. Good to see the Aussies playing better but the All Blacks will win!!! go the Mighty All Blacks!!! I speak to soon. Cruden has missed a sitter. That was unexpected. Wallabies have possession in midfield but the All Blacks' defence is solid and they turn the ball over. 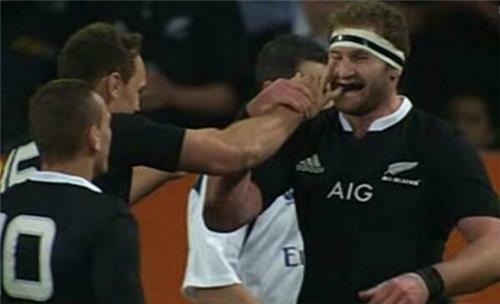 Messam to Mealamu to Savea. The ABs making good progress. Now they swing it wide right and TRY ALL BLACKS! Brilliant handling, brilliant passing, brilliant try. Smith to Retallick to Cruden to Dagg to Read and the captain touches down. These tries are superb! Even the wallabies tries are from the ABs. Cruden just misses the kick. All Blacks lead 38-26. In 56 minutes there have been 64 points. Quite remarkable. The crowd are definitely getting their moneys worth. Cooper, Savea and Folau continue their game of forceback before it ends in the hands of Dagg. All Blacks with possession now on halfway. Finally we have a scrum on halfway to slow things down. Just what everyone had been waiting for. Good scrum from the All Blacks and they go blindside through Barret and he kicks in behind. But the Wallabies come back strong. Kuridrani makes another great break before the All Blacks bundle the ball out into touch. Wallabies lineout from 20m. Another good chance. Penalty Wallabies. Do they kick for the corner or go for the three points? They are going for it. Lineout from 5m. McCalman takes it in, they are in good formation. Was Dane Coles name on the team sheet ?? Too much AB turnover. Just lock it down. But the All Blacks stand firm. The ref claims the Wallabies stopped then moved in the rolling maul. Contentious decision. ABs are up celebrating the decision. With just 17 minutes left that could be a big call. The only time the wallabies have scored is from AB lapses. Makes for an (overly) exciting game. All Blacks win the scrum and Smith hands off to Nonu. He ran straight into Cooper and the crowd went nuts. But the Wallabies have the ball again, now 22 out. They go wide right through Genia but he ran into his own man and the ABs are awarded a penalty. He looked a little bit hard done by there. So, 13 to go and the Wallabies trail by 12. Can the Wallabies do it? Any believers?